RS Components offer the professional range of Entrelec Standard DIN rail terminals. Three different functions are available. 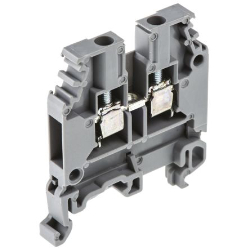 They are either Screw, Spring or Stud making these DIN rail terminals perfect for standard industrial applications. The offer the flexibility of Screw, Spring or Stud functions, snapping onto symmetrical and asymmetrical rails. Many colours are available in addition to generic grey to assist users to quickly identify any specific functions. Terminals of 70mm2 and larger include a hexagon key actuated rising clamp system. Terminal sizes up to and including 70mm2 require a separate end cover; larger terminals are of fully-enclosed design. The device approvals satisfy UL listed, CSA certified, ASE, SETI, SEMKO, NEMKO, DEMKO, GL, FIMKO, VDE, CEGB, KEMA, E ExiI/II, and E Exei/II.